There are currently two governments in Libya. 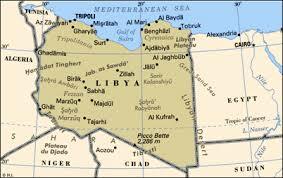 A "moderately Islamist" one in the west in Tripoli and one in the east in Tobruk. The eastern one is internationally recognized and "secular" but also supported by some Salafist groups. Both governments have their own parliament and various supporting militia. In the middle of the long east-west coastline the Islamic State led by some cadres from Iraq and Syria has taken a foothold in Sirte. It is recruiting followers from north Africa and moving to capture nearby oilfields to finance its further expansion. The "west" is alarmed about this development and wants to intervene with military force. Special forces from several countries are already on the ground. But both governments and their parliaments do not want such foreign intervention. The UN or someone came up with the glorious idea of creating a third government which is supposed to supersede the two existing ones. The task of this third government will be to "invite" foreign forces and to rubber-stamp whatever they will do. That third government is now constituted in Tunisia and has zero power on the ground in Libya. UK military doubles its effort in Ukraine. UN inspector says Saudi Arabia purposely bombing civilians.UK wants more warships near Libya, the Unity government want to be in power within a couple of days. US opposition says Syrian government stalling in talks. Saudi Arabia backed opposition wants Russia to stop support Damascus. Terror warning for Russia issued by US.